Norah Jones has a small role in upcoming film ‘Wah Do Dem’. AVC: The reception for My Blueberry Nights was pretty rough, and some of the reviews singled you out for your inexperience. Did you have any sort of trepidation about going in front of the camera again? NJ: No, I don’t. I think I did what I was supposed to do in that film, because the director… There was nothing to prepare for. There was really no script to prepare with. He instructed me very explicitly to not take acting lessons. He likes to place his actors or whoever they are, whether they’re actors or not—you know, whether I was good or bad, or whether people liked it or not, I had a great time. I love film, and I would love to be a part of something that people universally love as a piece of film. Sure. Of course I would. And I would love to take acting lessons, and see that side of it someday. But I’m a musician. These two films I’ve done, I’ve done because even though they’re very different, they’re kind of loose and they seemed interesting. I felt like they were just another way to be creative, both at times in my life and career where I’ve been a little burnt out on doing what I do. So they both kind of have had a similar placement for me. AVC: I’ll be honest, it’s not one of my favorite Wong Kar-wai movies. AVC: Wong was clearly working out of his element, and without a lot of his regular collaborators. NJ: Exactly. And I think for him, the language barrier—he speaks great English, but I think things are always more poetic on subtitles, so… [Laughs.] But I still loved making the film. I loved working with him. And I also loved, just visually his films are so beautiful. That one was no exception. And that was just really fun. AVC: There’s a lot of anticipation for all Wong Kar-wai’s movies, and that inevitably leads to disappointment sometimes. NJ: He just has such a cult following. And I think, of course, if he’s going to make a movie in America with some famous movie stars, he’s going to get jumped on no matter what. It was great, though. It was really fun. I mean, some of the actors I got to work with, that was a great acting lesson right there. Watching them take what they were given, which was probably not traditional for what they do either. Even though I was out of my element, I felt like everyone kind of was in that film, which made it interesting from my perspective. MADONNA: I look at movies like Wong Kar-Wai’s films, and they all have such a familylike feeling about them. He just keeps working with the same actors and art director and DP, and the stories don’t change that much. There seems to be this familiarity there that must be such a nice luxury. VAN SANT: Wong Kar-Wai is a really great inspiration. He’s always referred to as the Jimi Hendrix of filmmaking. MADONNA: What does that mean? VAN SANT: It means that he’s so loose and familiar with his craft that he can sort of do anything. MADONNA: I was actually watching In the Mood for Love  again last night because I love the music. And I mean, how overused is slow motion in film? But, for some reason, he gets away with it. Every time the characters pass each other on the stairs, there’s that same piece of music. It’s so beautiful. He has these two married couples living next door to each other, and you never see the wife of one couple or the husband of the other, but you always hear them talking. And it’s not so much of a story, but you’re so sucked into it. It’s something to be envied. While the stories seem simple, you really end up feeling kind of devastated and moved and melancholic every time you watch one of his movies-well, I do, anyway. VAN SANT: I do too. MADONNA: But maybe there’s something wrong with me. Maybe I’m just a sucker. VAN SANT: No, I think they’re very strong films. As the martial arts choreographer for Wong Kar Wai’s “The Grand Master”, what do you think of Ip Man trend? 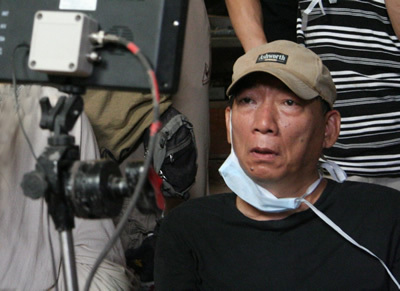 Yuen Woo Ping: It might bring back the kungfu film wave, when there are so many Ip Man related films. Actually, the first was Wong Kar Wai, he talked about it for years, but only started shooting now. They have already finished filming Ip Man 2, yet he hadn’t even started. I have to hand it to him, such patience, taking such a long time to do the preparation. I don’t dawdle, dawdling grinds people to death. Tony Leung is lucky to have met a good director, normally, they aren’t given so much time to train. Their collaboration is bound to be fruitful. Is it bad for so many to jump on the bandwagon shooting the same theme? Yuen Woo Ping: There are advantages as well as disadvantages, depending on how they are arranged. The audience might grow apathetic, like in the past, more than 100 Wong Fei Hung films were produced, but it was released at the interval of a few months, with no more than three being released each year. But if they released everything at one go, you’d be in for a big headache. Each era is bound to have certain paragons, in the past, it was Wong Fei Hung, now it is Ip Man. If you only shoot a similar subject after some time, the audience would feel fresh, when what you shoot has certain standards, it’s fine, but I fear they might not be able to keep up.